List of Ramadhan Buffet 2007. A Selection of choice that may include Kerabu Paru Paru, Gado Gado Rojak Buah, Ulam Ulam, Daging Masak Hitam, Ayam Sambal, Talang Masin Gulai Lemak Nenas, Kacang Panjang Goreng & Hati to name a few. This buffet Menu changes daily. A mixed of traditional Malay & Western cuisines. Price: RM28.00nett per adult and RM16.00nett per child Experience a different style of Berbuka puasa at Bintang Shack. Price: RM40.00++ per adult and RM25.00++ per child Tempting dishes from the action stall include Chicken and Beef Satay, Lamb Sharwarna, Roti Canai,Murtabak, Penang Prawn Mee, Ikan Bakar and succulent seafood. Price: RM35.00nett per adult and RM20.00nett per child Seafood & Thai food buffet. Price: RM38.00nett per adult and 50% off per child. Favourites such as "Kambing Tandoori", "Kari Kepala Ikan", "Sambal Terung", "Ketam Goreng Rempah", "Ekor Lembu Asam Pedas", "Udang Sambal" and "Rendang Daging Lembu" to go with "Lemang", "Ulam-Ulam", "Rojak" and a dazzling array of refreshing appetisers and desserts. Feast yourself to the main course such as ketam masala, ikan patin tempoyak, ikan tenggiri asam pedas, nangka lemak cili padi or opt for the action dishes such as the mee bandung, Johor laksa or ikan bakar. A meal is never complete without the dessert; spoil yourself with the honey dew pudding, warm chocolate pudding, bubur gandum and bubur kacang merah. Feast on an unbelievable spread of over 80 dishes during the month of ramadhan. Break yours fast with a splendid array opf authentic Malay dishes and a magnitude of sumptuous cuisine from the Middle East to an International fair lined in the hawker style buffet. Not forgetting the delicious selection of traditional dessert, Cakes & Ice Kacang guranteed to fulfill any cravings after a long day of fasting. Price: RM55.20nett per adult and 50%off per child and senior citizen. 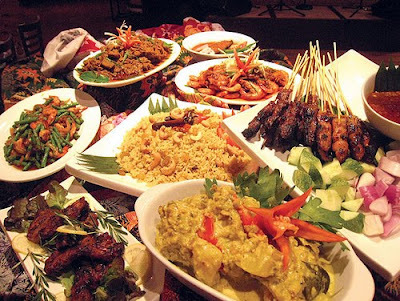 Buffet spread of traditional Malaysia dishes which include appetizers, salads, ulam-ulam, condiments and sauces, soups, carvings, shawarma, main courses and desserts, The harmonious sounds of Malay traditional music and Ghazal will accompany diners from 7.00pm onwards except Sundays. Price: RM40.00nett per adult and RM22.50nett per child . Price: RM35.00nett per adult and RM20.00nett per child. Break your fast everyday with different menu at price so right. including Tandoori Kambing, Lemang, Serunding, Daging Kalio, Ikan Bakar Asam Jawa, Rendang Tok, Paru-Paru Goreng, Sambal Tumis Udang Petai and Ayam Golek. Price: RM42.00nett per adult and RM21.00nett per child Special Price for Bankers: RM38.00nett per person Special Price for Government Servants: RM35.00 nett per person Feast yourself with splendid seven rotating buffet menus, each comprising of favourite local specialties. Set A : Tomato Rice with Chicken Rendang & Bandung Chiller. Set B: Tomato Rice with Chicken Char Siew & Bandung Chiller. Price: RM29.00nett per adult and RM14.50nett per child Malay Ramadhan buffet. Offerings include Rendang Pedas Udang, Sambal Sotong Petai, Ayam Perchik, Nasi Briyani, Lemang and Serunding amongst others. Price: RM30.00++ per adult and RM15.00++ per child & senior citizen Traditional Malay cuisine. music presented by "Kumpulan Seri Mewah". Serving local, Chinese, Continental, and hard-to-find dishes, you'll have a feast that you'll not want to forget. Dishes include Panggang Rusa (grilled deer), Udang Harimau Masak Lengkuas (spicy prawns with galangal), Daging Masak Hijau Berduan Selasih (green beef curry with sweet basil) and Ayam Panggang Madu (marinated baked chicken with chilli and honey). Ghazal music will be playing buffet. Traditional Malay favourites include Ulam Raja, Kerabu Mangga, Sup Ekor, Sup Tulang, Ayam Goreng Pedas, Daging Masak Lada Hitam, Udang Masak Lada Hitam and Udang Masak Tomato. Price: RM38.00++ per adult and RM16.00++ per child [Sang Bayu Poolside]Traditiona­l buffet style with sixty over types of dishes ranging from local, Chinese and International. Complete with tents and food stalls - it is designed to be carnival-like, putting camaraderie and fellowship back into our hectic daily lives. A special 6 traditional dishes ranging from appitisers, main course, soup and dessert on your mini table..
Puasa with Kelantan Delights cooking secrets. Price: RM39.00nett per adult and RM19.00nett per child Over 50 variaties of Middle Eastern & Local cuisine. Price: RM40.00++ per adult and 50% per child More than 60 Raya dishes served in Kampung style. Price: RM46.00nett per adult and RM23.00nett per child Tempting treats include Grilled Meats and Seafood, Assam Laksa, Talapia Lemak Cili Padi,Daging Minangkabau, Bubur Pingat Pisang and Kuih Muih. Three different menus will be rotated during the promotion. Price: RM55.00++ per adult and 50% per child Feast on an elaborate daily-changing buffet prepared by Hotel Nikko's Master Chefs during the month of Ramadhan. A delightful potpourri of evergreen Malaysian favourites such as Ikan Bakar Percik, Ketam Bunga Masak Rempah, Ayam Panggang, Kambing Marsala, Rendang Daging and Udang Kandar. What's more, the sumptuous spread will be expanded into Straits Restaurant. Look out for the specialty stalls serving Satay, Lemang with Serunding, Otak-otak and many more. Local International food (including Pastas). Be with the stars and break your fast and Planet Hollywood with its Ramadhan Buffet. Price: RM52.00++ per person Chef Wan joins us this Ramadhan and will prepare special Buka Puasa dishes at Eccucino Brasserie. A tempting spread aw aits with traditional Malay specialities offered. fare and North Indian cuisine. Halal chinese cuisine this Ramadhan. person (Ghazal performance) Live performance at Saloma's with good buffet. Ayam,Lemang, Rendang Ayam & Randang Tok, Kuah Lodeh and house specialities pengat Durian. We serves five types of sambal dishes - Sambal Tempoyak, Sambal Cencaluk, Sambal Budu, Sambal Belacan & Sambal Nenas. Our Noodle section features daily specials such as Laksa Utara, Mee Soup & Hilited Italian Spaghetti. The harmonies sounds of Nasyid & cultural show performance will accompany diners. Prayers room are also available for MUSLIM patrons plus we provide an ample free parking to our customer. Not only should you look forward to breaking your fast with the enormous spread of authentic local cuisine, but you should also save some room for the wide selection of kuih-muih to end your meal on a sweet note. For those who appreciate a little culture with their meal, you can opt for Botanica Brasserie's buka puasa delights under the cover of designer palm trees. You will also be entertained by a live ghazal performance. Di-Atas presents lip-smacking Ramadhan Delights, authentic local offerings such as Itik Solok, Ikan Keli Masak Tempoyak, Sambal Udang Galah Dengan Petai and many more. Savour typical Malay delights. Changed daily. friendly and informal atmosphere of The Coffee Shop. Price:RM47.00+­+ per person and 50% off per children Ramadhan buffet. Price: RM52.00++ per adult and RM31.00++ per child. Peninsula such as Laksa Kedah, Kedah's Nasi Ulam, Penang 's Char Koay Teow, Nasi Kandar, Curry Capitan or Kedah's dishes with Thai influences. Whet your appetite with hot & fiery Southern Thai dishes with a refreshing choice of beverage & sweet desserts for your breaking of fast this Ramadhan. ketam masak chili, just to name a few.